How to Load & Use Photoshop Actions to Automate Photo Resizing - Steven Chu's Tips! I’m currently writing an email to a client to explain how to use the photoshop action I just created for him, to automate resizing custom thumbnails for his website where they’ll all be the same size on a white background no matter vertical or portrait. And figured, we can all use this tutorial, so here it is! This is an automated action I created for you to BULK automate resizing of your photos. Open photoshop, open your Actions panel. In photoshop, go to Window > Actions. Then on the upper right corner of actions panel, click the options button (looks like down arrow + list symbol “=”) go to Load Actions. Load it! Then you want to select the option titled “thumbnail sizer” and manually click play (triangle) for each image and it will take care of everything and save a copy on your desktop. Or to do bulk images of folders in actions, I need to modify the last step and not have it close the file out. Choose the set that your Action belongs to and choose the conditional Photoshop Action that you just created. Choose the source folder where your collection of images are located. Then, choose a destination folder for your processed files to go into. I usually just create a folder inside of the original folder called “processed.” At the bottom, it says “stop for errors”. When I ran this batch, I kept getting a message that the if condition wasn’t available, but it still ran the batch anyway. I just had to click the button telling it to proceed. If you want to avoid this, tell Photoshop to log errors to a file. If you do this, the files that had errors will have to be saved manually to the destination folder. To me, it is much less of a headache to hit Enter/Return a few times than to have to manually save multiple images. 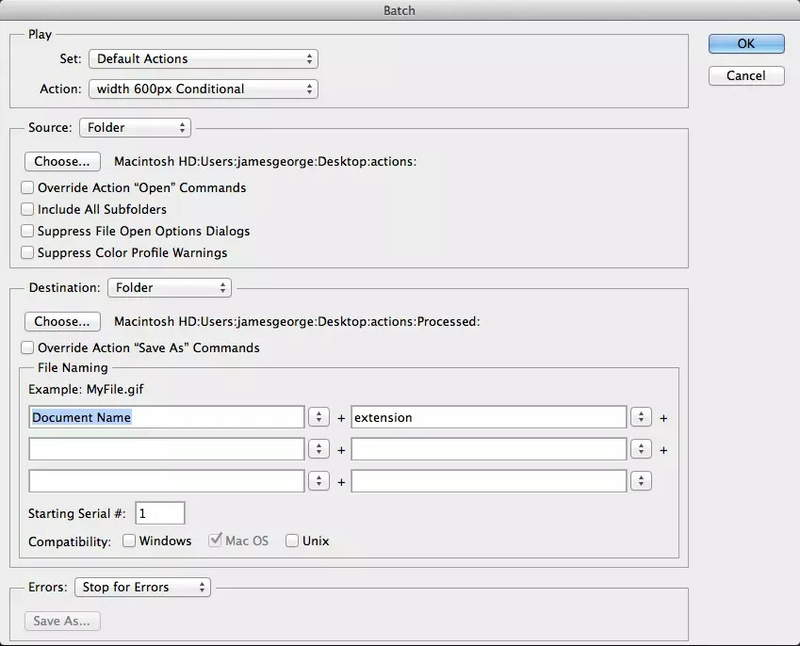 Photoshop Actions are an incredible tool for creating time-saving shortcuts for repetitive tasks. If you have a repetitive task that takes multiple steps, it is easy to just record it once and then have it available as a hotkey. If you have a folder full of images you can run a batch, taking a half an hour of manual work and tuning it into just a minute or two of work can save you tremendous amounts of time in the long term. With the addition of conditional Photoshop Actions, we can now save even more time by telling Photoshop to look for certain parameters. There are other conditions besides the landscape format, such as being square, RGB, being an unsaved document, and more.